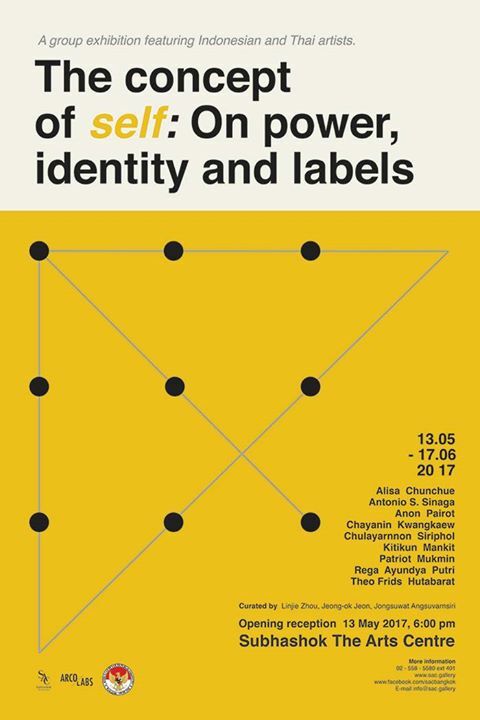 “The concept of self: On power, identity and labels” is a dissection of contemporary cultures and how they mold and alter individual lives, gender, social power, and the ideologies of class structures. It draws upon sociological theories and analyzes the processes through which societies as a whole and groups within them can deal with the challenges associated with membership and interaction within a culture. Social issues in contemporary Thailand and Indonesia are moved by a similar current of cultural transitions: redefining what it means to be a Southeast Asian. Introspection into the ever-changing society is prompting questions of “who decides what is normal?” and “how long does a cultural moment matter?” On the verge of a new regional structure, Thai and Indonesian societies are still finding and asserting what roles their cultures will play in ASEAN. While historically collectivist, both nations are seeing rises in the development of artistic individualism and social critiques. The artists are embracing their inner muses and confronting the order of the communal culture. We invite 9 artists: Alisa Chunchue (Thailand), Antonio S. Sinaga (Indonesia), Anon Pairot (Thailand), Chayanin Kwangkaew (Thailand), Chulayarnnon Siriphol(Thailand), Kitikun Mankit(Thailand), Patriot Mukmin (Indonesia), Theo Frids Hutabarat(Indonesia), Rega Ayundya Putri (Indonesia) to provide a conversation on the implications of macro and micro sociology of Southeast Asia as the self-concepts that emerged to distinguish a new age in Thai and Indonesian culture. Through various media such as photography, oil painting, video art and installation, the artists will explore the nuances in the expressions of identity and social interactions. Touching upon politics, superstitions, voyeurism, and self-analysis, this exhibition offers the necessary contrast and comparison to see how the individual is conditioned in this cultural shift. Linjie Zhou is a Bangkok-based Chinese curator at Subhashok the Arts Centre whose multi-cultural background provides interests in international creative exchange and greater cultural management; for which she had gained formal education at Chulalongkorn University of Cultural management in Thailand. Jeong-ok Jeon is a Jakarta-based Korean curator who is actively engaging in South East Asian contemporary art, especially working on providing international exposures for regional artists in and outside of Indonesia. She has gained formal education at Savannah College of Art and Design in the US and now serves as the director at ARCOLABS in Jakarta. Jongsuwat Angsuvarnsiri is the director and co-curator at Subhashok the Arts Centre. He has gained formal education at the Sotheby’s Institute of Art in London and is currently based in Bangkok. His personal interest in the art business, hybridized culture and sociology provides critical perspectives on this exhibition.